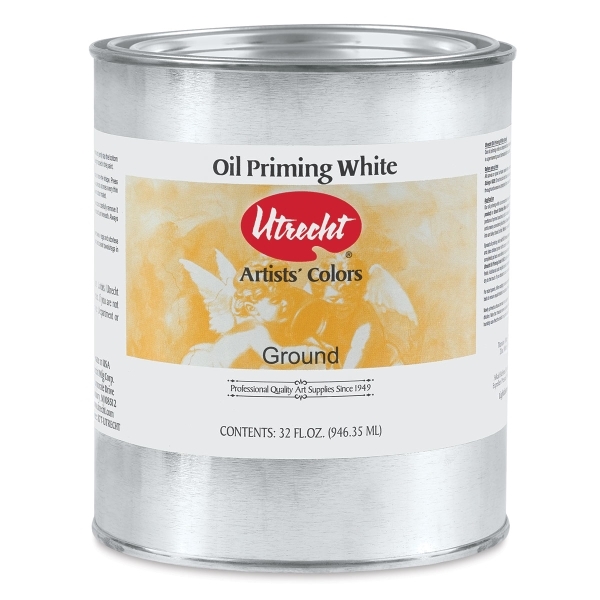 Create a solid foundation for your oil painting with Utrecht Oil Priming White. Handcrafted in Brooklyn, New York, Utrecht Oil Priming White is composed of titanium dioxide, zinc white, and calcium carbonate, all finely ground into a lean mixture of highest-quality linseed oil. It produces a bright, absorbent painting surface that's ideal for oil paints. This concentrated, heavy bodied primer must be diluted with gum turpentine or odorless mineral spirits to achieve a perfect heavy cream consistency for coating. Before priming, all canvas or panel surfaces first require either a natural sizing such as Utrecht Rabbit Skin Glue or a synthetic sizing such as Utrecht Acrylic Sizing. Utrecht Oil Priming White is ready for painting within approximately two weeks when you apply a single coat or 21 days for double coatings.